Yes, I know there was the information on all the Events, photos of everything, the beliefs/information, videos of the Services/Sermons, Every Baptism & Baby dedication received a special keep sake photo/video DVD’s & etc. I am Sorry, but they no longer want any media internet outreach. So everything has been shut down. Lord knows I tried my best to help out & spread GOD’s word. 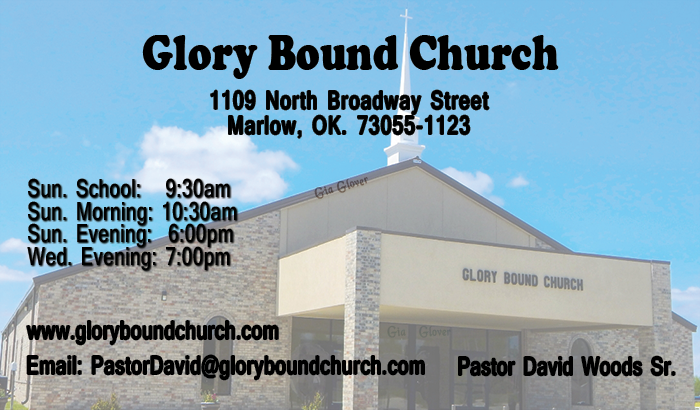 I worked everyday on designing something to promote Glory Bound Church. I was the Secretary, Technology (IT) Director (graphic designer, webmaster, video production/filming) not for any money though and absorbed all the expense, It is not about money or material things for me I just enjoyed the fellowship & feeling needed, wanted around, helping & being someone Special. I just paid to renew this website, so I could continue doing God’s work & keep everyone updated on everything, but I was blind sided and everything taken away. I hope everyone did enjoy the videos of the Sermons & everything, I always received positive feedback about it and I appreciate it. Like I always said anything I done (with God’s help) if it saved just one person it is worth it. I truly dedicated my Life to working for the Church (do like Matthew 5:16). Also the special keep sake photo/video DVD’s of every Baptism & Baby dedications. I loved to brighten people’s day and surprise them with those. It is just something I came up with, I wanted to make a keepsake for people to pass down to their Family. In fact I still have several of those DVD’s for various Family’s. I can not tell you all how much I always appreciated the kind words on everything I tried to do to promote God & the Church. I have received several messages asking why I have quit everything & etc. I never quit anything it was all taken away, this was my Life & I Loved it, the Church & the People. God has always came first in my life and He always will. I believe God wants us to reach out to and help people the way Jesus would have done if He were physically here. Just always keep in mind: What Would Jesus Do (John 13:34-35). I Pray that everyone will let the loving and soothing hand of the LORD touch your life & will warm your Heart with his peace, goodness, compassion & Love. As Jesus said: Seek to Live in my Love, I want my body of believers to be radiant with the Light of my Presence. How I grieve when pockets of darkness increasingly dim the Love Light.